The U.S. Shipping Board was established during WW1 to build and operate merchant ships to support the U.S. war efforts. After the war, the Shipping Board was the owner of a large number of surplus ships. Hundreds of worldwide shipping lines were established by the Board and ships put at the disposal of U.S. shipping companies acting as "managing operators" for the Board. 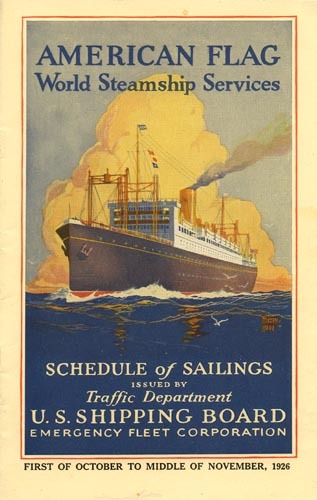 Most lines were eventually suspended or sold (including the ships), often to the managing operators. Several lines continued under former Shipping Board names even though they had been transferred to private owners. The list below comprises only Shipping Board lines of which there are brochures in my collection. In addition, some lines are listed, which are not mentioned in the brochures, but whose routes may be traced in them. American India Line (archives) New York-India via Suez Roosevelt Steamship Co.
Atlantic Australian Line (archives) New York-Australia via Panama, return via Suez Roosevelt Steamship Co.
California Orient Line California-Japan/China/Philippines Pacific Mail Steamship Co.
American Merchant Lines New York-London IMM - International Mercantile Marine Co. 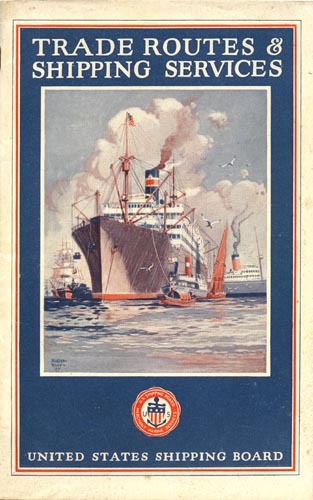 Mobile Oceanic Line Gulf-UK/Northern France/ Belgium/Netherlands/Germany Waterman Steamship Corp.
Southern States Lines Gulf-Netherlands/Belgium/Germany Lykes Bros. Steamship Co.
Texas Star Line Gulf-Northern France/Belgium Lykes Bros. Steamship Co.
United States Lines New York-Ireland/UK/Northern France/Germany Roosevelt Steamship Co., IMM - International Mercantile Marine Co. This page last updated April 22, 2011.